When - Thursday mornings in term time from 10.30am (although everyone is often a bit late!) until 12pm. Where - It is at Allerton Old School Rooms in the winter months and Allerton Cricket Pitch in the summer months. Who - everyone is welcome whether pregnant, Mums, Dads or Grandparents with new babies, toddlers or pre-school children. Donations - £1.50 per family. If you have any enquries please contact Lucy Halford 01934 732032. 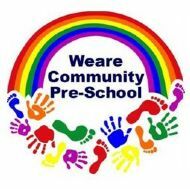 Weare Community is a friendly run Pre-School located at the Old School Rooms, Badgworth. We run Monday to Fridays from 9am-12pm (lunch club until 1pm available on selected days). We are a small Pre-School run by qualified staff and have a high adult to child ratio so we can provide personal care for the children and have a close relationship with the parents. We have a superb range of facilities inside and out and we strive to provide a safe, secure and stimulating environment for your child with a relaxed atmosphere to encourage play and social development. We welcome children from two years and currently have spaces available. If you would like more information or to pop in and visit please call Donna Cater on 07790 059 784.